The Weekly Stuff Podcast #249 – The Last of Us 5-Year Anniversary Retrospective Spectacular! 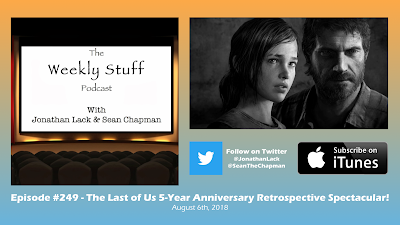 2018 marks the 5-year anniversary of Naughty Dog’s masterpiece The Last of Us,and with Part II on the horizon and having made a big splash at E3 this summer, we thought now was the perfect time to look back on the game that closed out the previous console generation, but in many ways presaged the major creative trends of this one. Alongside guest Thomas Lack, Sean and Jonathan go in depth reevaluating the game after a recent re-play, considering how it has aged, where it transcends its time and technology, and how its gameplay systems don’t just complement the masterful storytelling, but enhance it every step of the way.